Try this Mert 5-Piece Stainless Steel Cookware Set of one skillet and two pans if you are a beginner cook, setting up your first apartment, or are looking for a gift for a house warmng. Stainless steel with aluminum encased stainless bottoms. Stainless steel Is durable and dependable. Wears well. Materials Will not absorb colors or flavors from cooking foods. 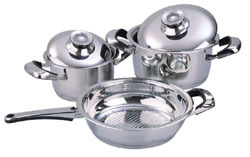 Heavy duty pan bottoms Have aluminum encased in stainless to spread heat quickly and evenly. Thermometer knob lids Help regulate cooking temperature. Tight fitting lids Prevent moisture and flavors from escaping and pans from cooking dry too quickly.